There were a few pieces of couture we had met before the Met’s red carpet. However, one piece seemed to stand out more than all the others. Ms. Paltrow emerged a Wonder Woman when she donned one at the Academy Awards earlier this year. A handful of others followed in her super-duper footsteps and draped themselves in fabric. In short, the cape was inescapable, wherever you looked. But my dears, some did it better than others – and, there was nothing short about it. Lana Del Rey looked pretty enough – the glossy locks, the burgundy lippy and matching nails (thanks, Lana) and her Altuzarra ensemble. However, there was something amiss. Was it her stance, by chance? Was it the glance? One must hold her head up high; one must carry a cape – not have the burden of carrying it. You know? I adore Maria Grazia Chiuri and Pier Paolo Piccioli’s designs for Valentino (not to mention their names! ), but I think MGC cut it a bit close to Gwyneth territory with an all white dress/cape ensemble. I prefer a sleeker silhouette under a cape, otherwise it's fabric city. Besides, G's cape was all about the shoulder staying power. Still want to know how it stayed on! Now, this doesn’t mean that because one woman rocked a cape on a red carpet that no other can follow. Why not forge a new path? Like I always say, if you are lucky enough to go, go grand. Take Bianca Brandolini D'Adda, for example, in decadent Dolce and Gabbana. I adore Domenico and Stefano’s homage to both Prada and Schiaparelli, here. But – make no mistake – it’s also very, very Dolce and Gabbana. She was glowing all night! What more could a woman ask for? "Reflections of what life used to be...reflections of..."
Linda Fargo, Vice President of Visual Merchandising at Bergdorf Goodman, is no stranger to making a dramatic entrance. She always stands apart from the crowd. Last night was no exception. She wore a custom dress and cape by an American designer - not Schiaparelli, as many (including moi) first thought. 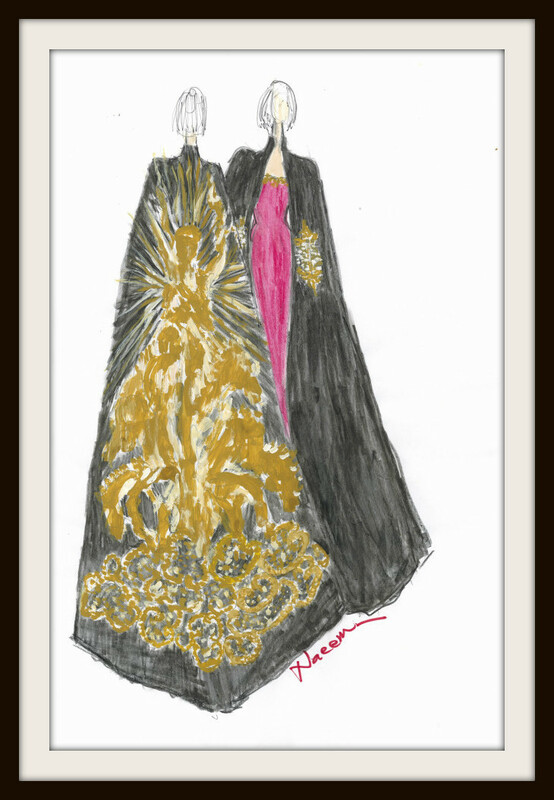 Naeem Khan custom designed both pieces for the fab Ms. Fargo. This is the sketch of his creations. 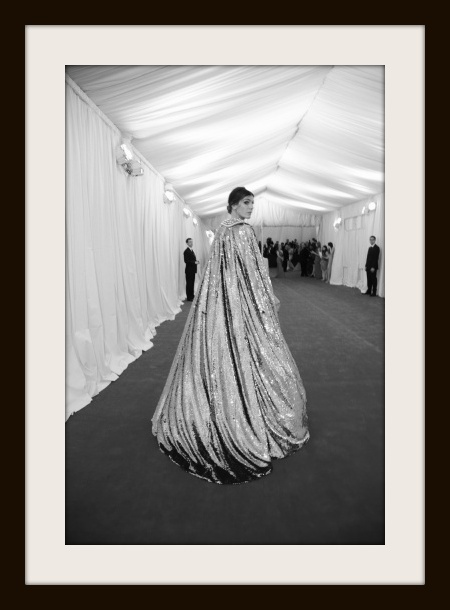 So, if you did guess that it was a Schiaparelli cape, you weren’t far off…Khan most certainly must have looked at the Met’s collection, for inspiration. 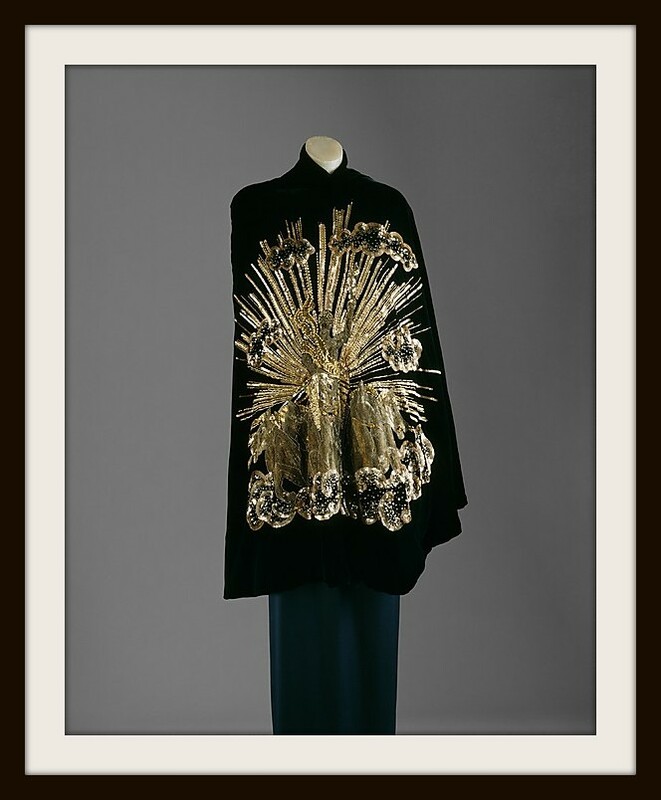 Apollo of Versailles Schiaparelli Cape, from the Metropolitan Museum of Art's collection. Khan's Deco design was breathtaking. Like I said, why follow, when you can leave a trail. A golden moment, captured in black and white. I have a few, but I am cape-able of loving a few more. The floor-length version still eludes me…but you know, my dears, I do believe in the magic of the universe. Yes, I have more Met stories to tell. More, tomorrow. Read all Met Gala 2012 posts, so far. Original images are credited as follows (all have been modified by yours truly): 1, 6, 10. Dimitrios Kambouris Getty Images North America; 2. Joe Schildhorn via Style.com; 3. Jason Merritt Getty Images; 4, 5, 7. Larry Busacca Getty Images North America; 8. Sketch via blog.bergdorfgoodman.com; 9. Metmuseum.org; 11. Vogue.com.